3 Arrested In Southern California Fire : The Two-Way The fire, apparently started at a camp site, has swept through more than 1,500 acres in the San Gabriel Mountains east of Los Angeles. A wildfire burns in the hills just north of the San Gabriel Valley community of Glendora, Calif., on Thursday. This post was last updated at 9 p.m. ET. Authorities have arrested three men on charges of recklessly starting a fire that has swept through more than 1,700 acres in Southern California's San Gabriel Mountains, about 25 miles northeast of Los Angeles. It is currently 30 percent contained. Authorities say they have ordered people evacuated from 1,000 homes. Among the warnings coming from the Los Angeles County Fire Department is one telling residents to look out for "wild animals that may be driven from their habitat due to the Colby Fire." As of 7:45 p.m. ET, the department said that one civilian and two firefighters have been injured by the wildfire. Five family structures had been destroyed, along with 17 other buildings, the agency said. The fire has forced some 2,000 residents to evacuate. 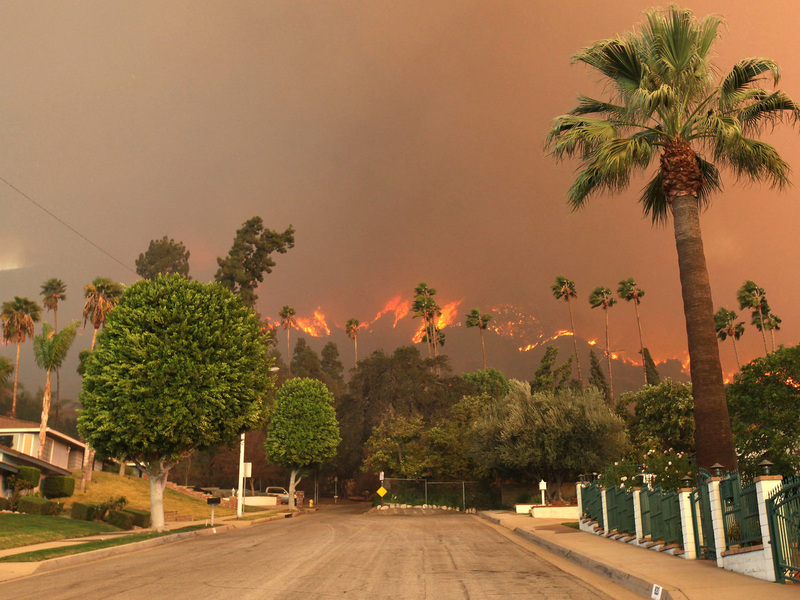 "The Colby Fire had burned 1,700 acres and destroyed two homes after breaking out at approximately 5:50 a.m [PST], according to the Los Angeles County Fire Department." "The blaze began near the intersection of Glendora Mountain Road and Colby Motorway, and was 'spreading fairly aggressively,' said Inspector Scott Miller." "The three suspects, including a homeless man from Los Angeles, 'were tossing papers into [a] campfire and a breeze reportedly kicked up and set this fire,' Glendora Police Chief Tim Staab said at news conference." "The three men were being held at the Glendora city jail in lieu of $20,000 bail, Staab said." "Winds were gusting up to 30 mph Thursday morning and were projected to climb to 40 mph by Thursday night, said Scott Sukup of the National Weather Service. With relative humidity expected to remain in the single digits through Friday and temperatures forecast to hover in the 80s and 90s, 'it's not going to get any better' for firefighters Thursday, he added." "Crews will also have to deal with unpredictable winds at lower elevations where cooler air is being pulled up toward the fire, Sukup said."